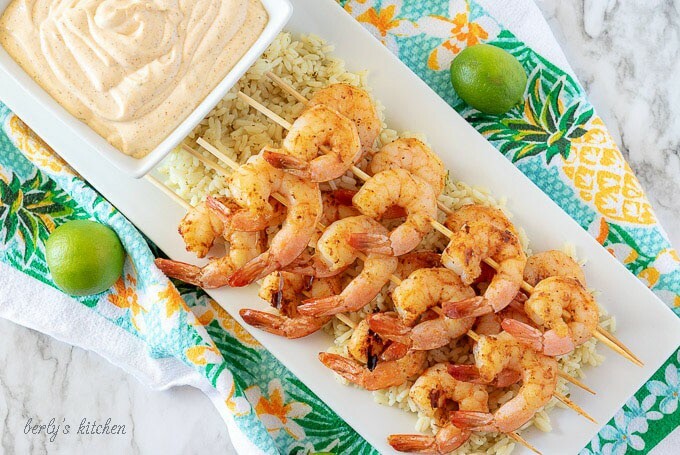 A fast and easy grilled shrimp appetizer that mixes savory seafood seasoning with tart and tangy key lime dipping sauce. It’s sure to be a BBQ favorite! It’s been a few months since Kim and I made the move from Florida to Arkansas. While Arkansas has always been home to us, it’s where we met after all, there are a few things we miss about living on the coast. Light, island themed dishes and happy hours featuring tropical drinks and tapas inspire a strange homesickness that the gorgeous mountain scenery just can’t satisfy. Since I’ve no ambition to move back to the Sunshine State, I have only one option. Bring the flavors of Florida into my own home here in the Ozarks. What better way to do that than to serve a dish featuring a tangy lime native to the Keys? Let’s get started! First, if using frozen shrimp, thaw them out and pat them dry with paper towels. For a quick defrost, try pouring the shrimp into a large mixing bowl and then cover them with tap water. Wait 10-minutes, then drain the shrimp, and repeat the process until the shrimp are totally unthawed. Next, in a medium mixing bowl, toss the shrimp with the olive oil and seafood seasoning. I used my hands for this step because it’s easier for me to coat the shrimp evenly with oil and seasonings using my fingers. Then, thread 4-5 shrimp on each bamboo skewer and place them on a preheated grill for 2-4 minutes in each side. Try to make sure and leave about 1/2-inch of space between each shrimp to ensure they cook on all sides. Last, remove them from the grill and set the grilled shrimp on a plate to rest while you make the aioli. First, in a medium mixing bowl, combine all the key lime aoili ingredients. That’s correct, there’s no rhyme or reason, no specific order. Just toss all the ingredients into one bowl, no fuss. Next, use a whisk or fork to mix everything together. When mixing, really get your wrist into to and break up any spices that might’ve clumped together. The finished aoili should be smooth and creamy. If it’s too thick for you, you can add a little milk to it to thin it out. However, it may affect the flavor and require you add a little more spice. I would caution you against adding more lime juice, this sauce is pretty tart already, so increase the key lime juice at your own risk. Last, serve the aoili with your grilled shrimp. Yep, that’s it, it’s that easy. The instructions may look intimidating, but I promise you, this recipe is super simple. 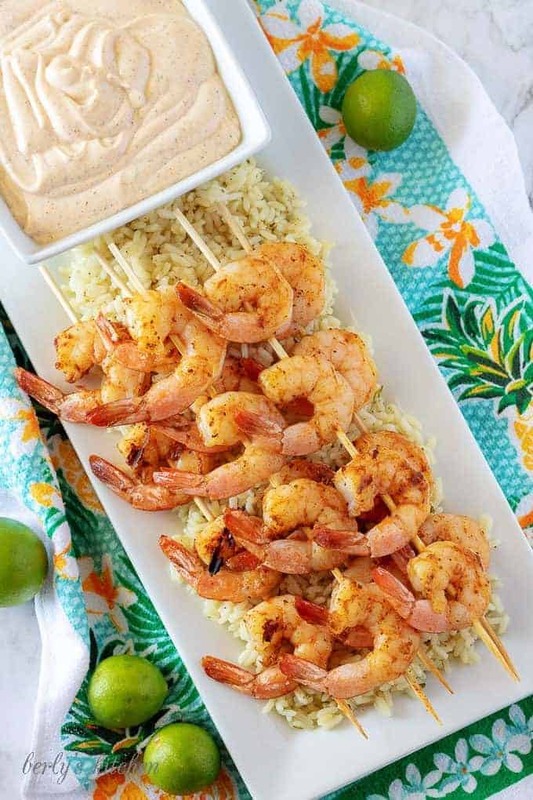 You can serve the grilled shrimp over a bed rice or you can remove them from the skewers, place them on the rims of martini glasses, and add sauce to the glass. In other words, cocktail style. Anyway you serve them, they’re sure to please. To ensure your skewers don’t burn on a hot grill, then try soaking them in tap water for at least 10-15 minutes. The bamboo skewers should absorb enough liquid to keep from charring on the grill since they will only be cooking for 2-3 minutes on each side. For maximum key lime flavor, prepare the aioli a few hours in advance. It seems to me, aiolis, dipping sauces, and other heavily spiced side sauces seem to intensify in flavor as they chill. This subjective observation is not based on any scientific evidence I’ve found, it’s simply based on my opinion. So as always in cooking, do what you know works for you. Pay very close attention to the shrimp as they grill to make sure they don’t over cook and become rubbery. I usually pull my shrimp when the very center of the deveined area is still clear (gray). Then I let the shrimp rest for 5-7 minutes and finish cooking. With that being said, I don’t usually serve my grilled shrimp hot. Our Coconut Rum Mojito is a wonderful drink to serve with this appetizer. If rum is not your thing, then pair this grilled shrimp with another awesome Summer beverage, like our spiked Lemonade Tequila Drink. 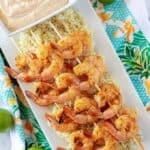 A fast and easy grilled shrimp appetizer that mixes savory seafood seasoning with tart and tangy key lime dipping sauce. It's sure to be a BBQ favorite! First, if using frozen shrimp, thaw them out and pat them dry with paper towels. Next, in a medium mixing bowl, toss the shrimp with the olive oil and seafood seasoning. Then, thread 4-5 shrimp on each bamboo skewer and place them on a preheated grill for 2-4 minutes in each side. Last, remove them from the grilled and set them on a plate to rest while you make the aioli. First, in a medium mixing bowl, combine all the key lime aoili ingredients. Next, use a whisk or fork to mix everything together. Last, serve the aoili with your grilled shrimp. The calories listed are an approximation based on the ingredients and are NOT accurate because they include all of the aioli separated into 4-servings. However, this is not correct because a proper serving size of the sauce is only about 1-Tblsp. The aioli recipe makes approximate 2-cups, more than needed for this dish. On the positive side, the sauce will store in a sealed container, in your fridge for up to 3-days. So, we tend to use the left-over aioli for Mahi-Mahi, Salmon, and even grilled Chicken. 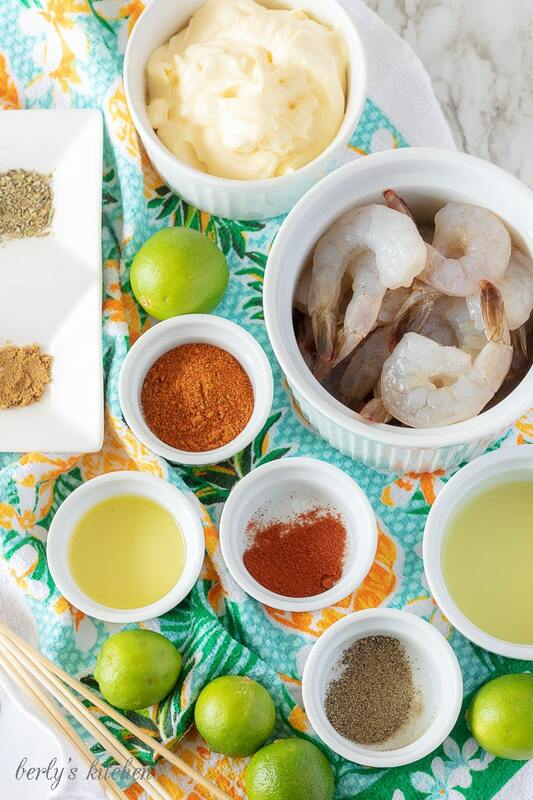 I adore grilled shrimp and your lime aioli looks absolutely perfect!! It’s fun that you can still eat like you are in Florida still! I would be bummed if I moved somewhere there wasn’t fresh seafood!! 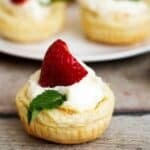 Beautiful photos and awesome recipe! Oh the shrimp, that aioli makes me drool. A perfect Friday night dinner for me. 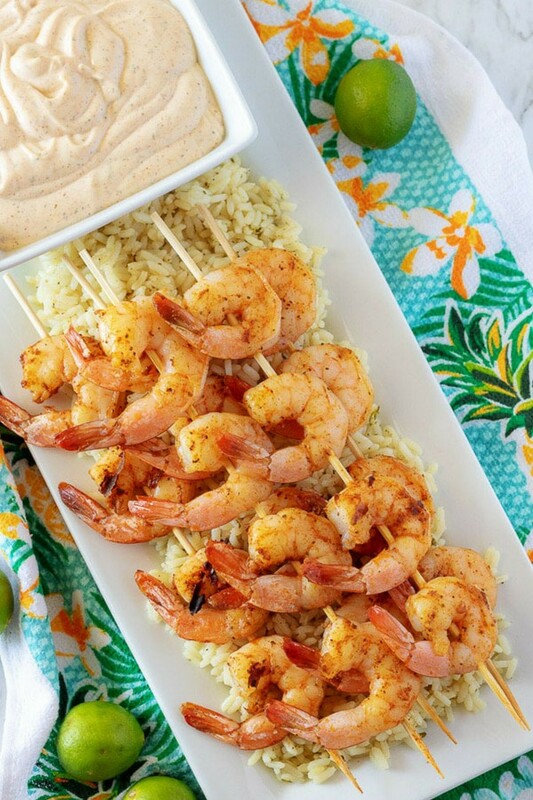 Grilled shrimp is such a fantastic summer dish, your dip sounds amazing! I don’t think I would have thought to add the dill, I bet it’s the perfect addition of fresh flavor to go alongside the lime! What a great way to bring the flavors of your former home to your current one! This shrimp looks so light and refreshing! I haven’t used key lime in savory dishes before, and this looks like a great way to do just that. We are huge shrimp lovers and eat quite a bit of them. We love trying different recipes with one of our favorite seafoods. The aioli would be a wonderful contrast to the sweet shrimp. And we’re very much like you. Like Florida for a time but wouldn’t want to live there. Too congested at times but my, oh, my the seafood is great. Hubby loves to fish and at times we’ve lived like royalty on seafood. Will be saving this recipe. Grilled shrimp makes such an easy tasty meal. Love the addition of the aioli for dipping to this version! 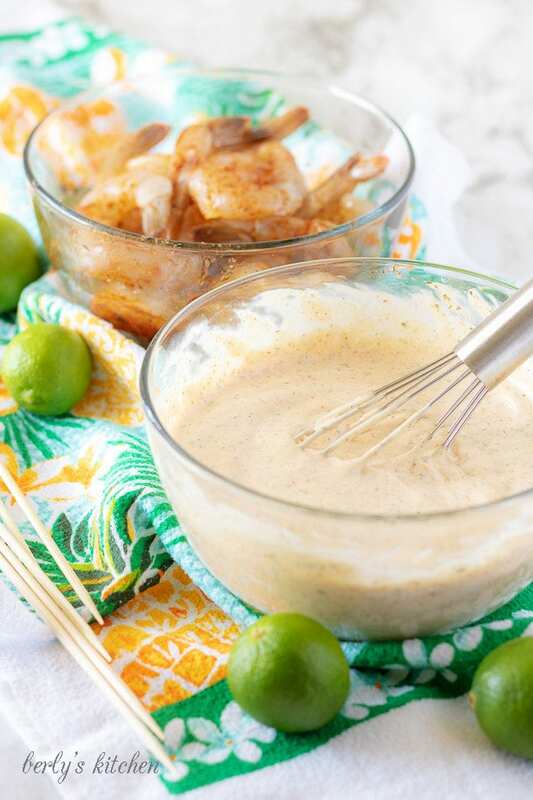 Key lime aioli is one of my favorite sauces to use with shrimp! Makes me feel like I’m sitting beachside when I’m landlocked instead. I freaking love shrimp so you already had me sold – but the aioli really kicks it up a notch. Love it! This looks and sounds delish!! That’s a hard move to go from FL to Arkansas…quite the different environment! I love that you brought the coast to you! Looks like a perfect dish!! What a combination, love the aioli sauce and shrimp together.